Round 4: Hernandez lands a solid right. Hernandez hits Frias in the body with a straight right. Overall Summary: In the welterweight main event, Freddy Hernandez (26-1, 18 KO's) won a 10 round unanimous decision over Damian Frias (16-2, 7 KO's). All three judges scored the bout 98-92 or 8 rounds to 2. I scored the bout 99-91 or 9 rounds to 1 for Hernandez. The 30 year old Hernandez dominated the entire fight using his aggression and body punching with the exception of the last round. He beat Frias to the punch all fight, but did not have the power to finish him. Hernandez went to the body often, usually scoring with his crisp left hook. He repeatedly imposed his will on Frias forcing him to fight backing up. Frias, who is a southpaw, came on late and landed some solid, clean shots in the 10th round. Hernandez appeared momentarily hurt after taking a straight left on the chin. However, Hernandez did the smart thing by tying up Frias when he was on the attack to weather the storm and take the decision victory. 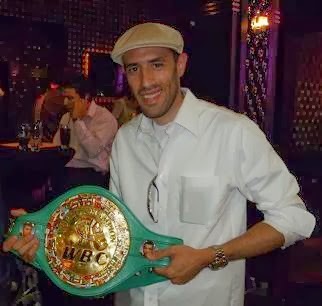 Coming into the fight, not only did Hernandez have an edge with his professional experience, but he also possessed an edge with his amateur background as well. Hernandez fought 54 amateur bouts to Frias' 3. Hang a punching bag without drilling with a heavy bag stand.